These products are mp3 audio track downloads of music from The Harp of Brandiswhiere CD by Sylvia Woods. 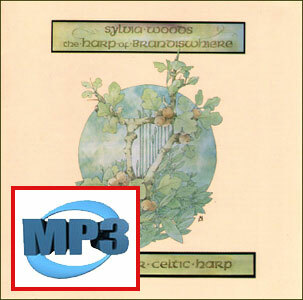 The Harp of Brandiswhiere is Sylvia Woods' highly acclaimed "Suite for Celtic Harp." Her beautiful compositions musically present the story of Brandiswhiere, a legendary magical harper. Sylvia plays both nylon-strung and wire-strung Celtic harps, and is accompanied by acoustic instruments such as trumpets, flutes, cimbalom, celeste, bass and percussion. The music is all instrumental, with no singing or speaking, allowing the instruments to weave a fine and intricate aural tapestry to illustrate the legend. An illustrated story book including this music is also available.